My wife Pat and I decided to make our home here in San Diego in 1978 and a year later we opened the Blarney Stone Pub in Clairemont. Word got out that we were involved in organizing the St. Patrick’s Day Parade back in Hartford, Connecticut and I quickly found myself in planning discussions with Vincent Lynch, Tom Mulcahy, Father McGovern, Rod Page, John Reynolds and Jim Shannon about starting a parade here in San Diego. We adopted the same approach we had used in Hartford, which was actually borrowed from Holyoke where I had also volunteered. There, we enlisted the support of the Mayors, fire departments and high schools of all the area towns, so here in San Diego we got to work on the fourteen cities around our county. It was slow-going getting the Irish up, but when we convinced Mayor Callahan of Coronado and Mayor Morgan of Chula Vista in early 1980, the parade picked up steam and we hit the streets of San Diego in March 1981. Vince Lynch was the first President. The Parade organization grew quickly to include a number of hard-working volunteers including Dave Shean, Pat Bergin, Frances Avik, Claire Houlihan, Larry Cronin, Dana Fowler, Pat Flannery, Tom Nolan, Tom Clancy, Mary Testa, Joe Botkin, Des Marmion, Colleen Murphy, Brian McLellen, Bob Mulrooney, Pat McIntire, Peggy Cahill, Michael Wilson, Tom Rodstrom, Chuck Fox, Charlene Bromley, James McNaughton, Kathleen Bradley, Barbara McCarty and many, many others. 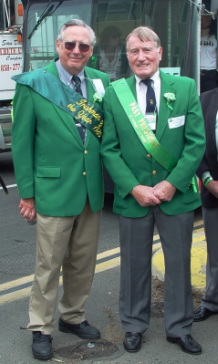 Jim Shannon suggested a simple name for the parade organization, the “Irish Congress of Southern California”, and bylaws were created with the express purpose of presenting an annual St. Patrick's Day Parade and Festival. The parade was to be no longer than two hours and strictly non-political. To add to the festivities, it was decided to host an annual Miss Colleen Pageant and Bernadette Cashman was the first Pageant Chairperson. Many of the early organizers stayed on for years, for example, Mick Ward arrived in the mid-1980’s and soon was “volunteered” to serve as the Emcee for our annual Miss Colleen Pageant. He did such an outstanding job that the Committee refuses to allow anyone else have the job and in 2011 he completed his 27th consecutive Pageant. Thinking back over the years, I recall that first day in 1981 when Tom Mulcahy and I were standing on Juniper Street and Sixth Avenue as we kicked off the first parade to the resounding march of a high school band. I was proud that we began it and I've been proud to watch it grow every year due to the hard work and long hours of so many dedicated volunteers. The festival in Balboa Park has been a joy with so many of our talented Irish musicians. San Diego's celebration is a special event that still has that cozy, small town feeling today that it did all those years ago, even though San Diego has grown up around us. This singular event is an invitation to all of San Diego to be Irish with us for the day, and it showcases the best of our community. We still stand on that corner every year for the parade start and I feel as excited today as I did back then. Congratulations to all who made the magic happen again this year!